After Sunday’s shootout loss to the Anaheim Ducks, the LA Kings found themselves in 4th place in the Western Conference and 2nd in the Pacific Division. The Ducks now have a nine point lead on the Kings for the division race with only nine games to go. Barring some unforeseen collapse, it’s pretty safe to say that Anaheim will win the division. That’s not a problem for Los Angeles though. The Kings have already learned through experience that the division title is not a necessity. All they need is that little “x” next to their name in the standings and the magic can happen from there. While they certainly don’t want to sneak into the playoffs as the 8th seed again, Los Angeles taught the hockey world a lesson last season when they became the first #8 seed to win the Stanley Cup. The big question this year is how can the Kings find that rare magic again? The Kings began their magical run a year ago well before the playoffs even started. The team already had a Vezina candidate in Jonathan Quick, who was helped by a smothering defense in front of him. However, the team lacked firepower and were a 50/50 bet in February to even make the playoffs. Enter General Manager Dean Lombardi to the rescue. Noting that his team had almost all of the pieces already in place for the next few years, Lombardi unloaded defenseman Jack Johnson and a 1st round pick to Columbus to pick up Jeff Carter and his renown scoring ability. The team finished on a 13-5-3 run after acquiring Carter and locked up the 8th seed in the West. The rest of the story is history. As this year’s deadline approached, Lombardi found himself with a completely different conundrum. The Carter trade was still paying off with offense (Carter is currently tied for 3rd in the NHL with 23 goals), but the defense had been plagued by injuries. Matt Greene is still recovering from early season back surgery and Willie Mitchell is done for the year with a knee injury. The general manager came to the rescue again, shipping away two 2nd round picks to Buffalo for veteran defenseman Robyn Regehr. Regehr provides a strong stay-at-home presence on the blue line and the Kings didn’t have to give up anyone from their roster, automatically improving the team on the ice. Regehr also has the added benefit of experience, having played under Head Coach Darryl Sutter before. 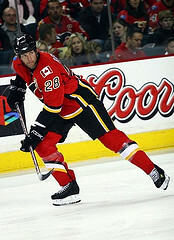 Both men were part of a Calgary team that went to the Stanley Cup Final in 2004 but lost in 7 games. Through just three games, Regehr has already made a significant impact on the Kings’ blue line. He has provided another steady presence that can handle plenty of minutes, averaging over 21 minutes a game with a +3 rating. He has also demonstrated how his defensive prowess can turn a play completely around. In his debut against Minnesota, he made a poke check at the blue line that landed on Anze Kopitar’s stick. Kopitar turned and moved the puck up ice to Justin Williams on a turnover that the Wild weren’t prepared for. Williams then rifled a shot to give the Kings a 3 goal lead. Regehr was given the 2nd assist, his first point as a King, and earned the 3rd star of the game as well. Add in his 12 hits through three games and it looks like Dean Lombardi has successfully boosted his team for the second year in a row. While the Kings boast plenty of forwards that are strong two-way talents in Mike Richards, Anze Kopitar, and Dustin Brown, their scoring can be a bit streaky. The acquisition of Jeff Carter alone wasn’t enough to boost the Kings last season, but it coincided with Dustin Brown hitting a hot streak as trade rumors about him loomed. This year, Justin Williams has come to the forefront as of late. Williams currently has the longest active point streak in the NHL with 6 goals and 2 assists in his past 7 games. He’s now second on the team with 29 points, only trailing Anze Kopitar, and this is despite being only 8th on the team in powerplay points (5). Williams is often left out when discussing the big names of Kopitar, Brown, Richards, and Carter, but he is far more than an afterthought on the first line with Kopitar and Brown. Luckily for Kings’ fans, he also keeps his philosophy very simple. On his goal scoring streak that just recently ended, Williams quipped, “Oh, I don’t know. I have a lot of shots this year, so I just assumed at some point they’re going to start to go in.” With a team-leading 127 shots, it’s a safe bet that at least a few more of Williams’ shots will hit the back of the net. Bernier is no longer just watching Quick take over in net this year. (Photo by Heather Abrahamson). 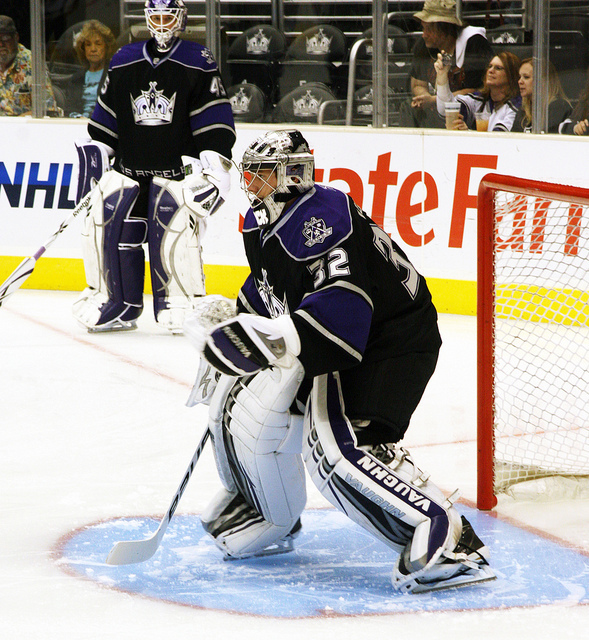 The perplexing aspect of the Kings’ goaltending situation has shifted from rumors to results. Bernier is 9-2-1 with a 1.86 GAA and a .922 save percentage. Meanwhile, starter Jonathan Quick is 13-11-3 with a 2.49 GAA and .898 save percentage. While Quick had a very slow start to the season and has certainly improved as of late, the numbers are still troubling and Bernier has earned a bigger role. Where does that leave the Kings entering the playoffs though? Defense – check. Offense – check. Goaltending – murky? Entering the season, not a soul would have questioned how the Kings would fare in terms of goaltending during the year. This is Jonathan Quick’s team and it’s supposed to remain that way for the next 10 years. Now the picture is a little cloudier than anyone wants to admit. Maybe the chances of a repeat championship don’t depend on the Kings having another magical run to greatness. Perhaps, the final answer just rests on which goaltender can play up to the challenge. If the answer is Bernier, the immediate follow-up question will be whether the franchise is open to taking advantage of it at the expense of Quick. After all, magic is good from any source, right?